Organic gardening can be a contribution to the quality of the environment. If you are a vegetable gardener, it is also a contribution to the quality and safety of your edibles. Suburban gardeners, pick up your garden hoses! Oh yes, and learn to pinch together your thumb and index fingers. Here we go – a lesson on organic gardening. Organic gardening involves the gardener’s approach to soil preparation, fertilizing, pest management, and weed removal. As you might imagine, the organic gardener will practice the most environmentally safe methods. Once you have selected your vegetable garden plot location, whether your soil is clay or sand (or anything in between), you will want to supplement the native soil with an organic compost soil amendment containing mychorrizae and fortified with nitrogen and iron. Roto-till or use the good old-fashioned shovel to mix in these amendments and level out the soil. Using pre-mixed organic garden soils, potting soils and compost(Kellogg’s Garden Products) will make amending your garden very easy and will add all the beneficial nutrients/organisms your plants will need to thrive. Of course, many gardeners like to maintain a compost pile. Composting, done properly, is an excellent product to enhance the soil and thereby improve the plant heath. Other gardeners like to use manure as a portion of this soil amending process. If that is your choice, make sure that you do this a month or so ahead of planting the garden, and water thoroughly. Manures add a considerable amount of salt and high nitrogen to the mix, too much for new young seedlings or plants. Fertilizing can sometimes seem complicated. 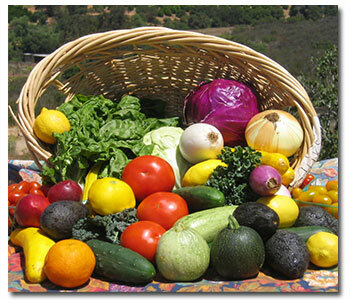 The three most important nutrients for healthy plants are N-P-K or nitrogen, phosphorus and potassium. Nitrogen is necessary for healthy, green plant foliage growth. Phosphorus is needed for the plant’s root, flower, and eventual fruit (veggie) growth. Potassium is necessary for overall healthy plants through good root growth and fruit production. All of these nutrients are in your soil naturally. Depending upon your soil type, they may be in balance or they may not. You could have your soil tested for nitrogen, phosphoros, potassium (NPK) and other minerals to determine whether you have any deficiencies at all. If you are a compost gardener, this process adds all of the nutrients that your soil and plants need. If you do not compost, then you may want to consider other organic products that will enhance the quality of your soil. Organic sources of nitrogen (N) are derived from fish meal, cottonseed meal, alfalfa meal, fish bone meal, and feather meal. Organic phosphorus (P) comes from fish bone meal, cottonseed meal, alfalfa meal, and soft rock phosphate. And finally, organic potassium (K) comes from kelp meal, cottonseed meal, alfalfa meal and mined potassium sulfate. The nutrients are released quickly as the beneficial soil microbes called mychorrizae digest the product. G&B Organics offers a full line of organic fertilizers. You will discover that all of the products contain varying N-P-K ratios. Ask one of our staff for assistance in determining which will be the best for your individual garden. Are there unwanted visitors in your garden? Time to apply good IPM (Integrated Pest Management) practices, using organic fertilizers and resistance to applying herbicides (for weed killing). Integrated Pest Management, or IPM, is the approach to pest control that requires regular monitoring of your garden to determine if and when treatments are needed. And it employs physical, mechanical, cultural, and biological methods to keep pest numbers low enough to meet your toleration or annoyance levels. Classic organic gardening pest management employs simple, completely non-toxic techniques such as hand-picking the tomato horn worm, hand removal of leaves harboring the leafminers, squishing snails or water-blasting off aphids or cabbage moths from your plants. Now you understand the need for your garden hose and pinching fingers! The next level up is to use the least toxic controls such as insecticidal soaps, spray oils, and other natural products (Spinosad) to combat annoying insects, powdery mildew and rust. This category of products satisfies another large group of gardeners – those willing to spend time evaluating their plants and treating (and retreating) upon need. This level is also still safe to apply to edibles. Products such as Monterey® Sluggo® to combat slugs and snails and Monterey Neem Oil to control insects and fungus are affective organic methods for these pests. Now, what about the weeds? Avoid herbicides in vegetable gardens. Some gardeners like to use a cover crop such as clover in between their rows of vegetables. This works great. Or, you can cover your hands with a great pair of gloves and pull out the weeds (it’s good exercise, too)! And then, to keep the weeds down, MULCH, MULCH, MULCH. If you have a stubborn weed or a serious problem use Weed Zap Organic herbicide. Organic vegetable gardening is especially rewarding. Your vegetables will be so fresh, so delicious, so much the ultimate of vegetable goodness, that you will become spoiled and never want to buy from a grocery produce department again. Every time you step into your garden to harvest tomatoes, beans, broccoli, potatoes, lettuce, or whatever you have grown, a smile will rise to your lips. Be proud of yourself. You should be!